2014, Hardbound, Large format, 240 pages, 405 illustrations, pedigrees. This new dynastic biography focuses on Grand Duke Adolphe of Luxembourg, the former Duke Adolph of Nassau, and his descendants. 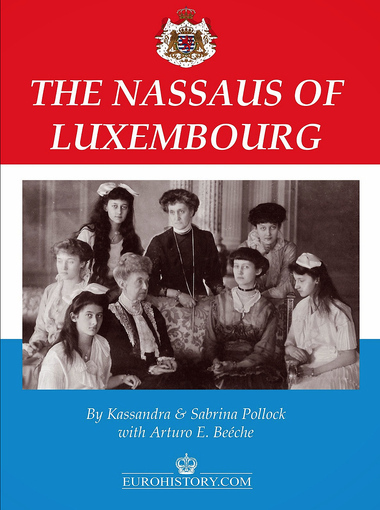 Divided in eight chapters, THE NASSAUS OF LUXEMBOURG covers the life of Grand Duke Adolphe, Grand Duke Guillaume IV, Grand Duchess Marie Adelaide, Grand Duchess Charlotte (including Grand Duke Jean and Grand Duke Henri), Princess Hilda of Schwarzenberg, Crown Princess Antonia of Bavaria, Princess Elisabeth of Thurn und Taxis and Princess Sophie of Saxony. With the assistance of several descendants of Grand Duke Guillaume, the authors have managed to piece together an interesting narrative, while bringing to the English-reading public the history of one of Europe’s most respected dynasties. Hardbound and glossy-paged, this volume contains hundreds of photos of many of Duke Adolphe’s descendants. Many of these images were donated by the family, a considerable number were taken by one of the authors, while the rest come from the Pollocks’ private collection, as well as the Eurohistory Archive. "This book’s concept began with our frustration over the lack of English language sources available on the six beautiful Nassau sisters of Luxembourg, their descendants and the families they married into. We, however, wanted to know more. Thus, we braved our way through whatever foreign language materials we could find, and as we learned more about the princesses’ lives our interest grew to include the account of their parents’ courtship and eventual marriage, a union which is one of the more touching but tragic of history’s untold royal love stories. Nor would the narrative of the sisters’ lives be complete without an explanation of how their grandfather came to inherit the Luxembourg throne. We hope you enjoy our effort..."